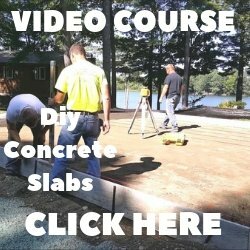 You're trying to figure out what to do with your garage floor and there's just so much information out there, it's overwhelming. You want to make the right decision! But you just don't understand the difference between all the epoxies, paints, stains and sealers everyone is selling. They all claim to be the best and the easiest to apply! Well, That's where I can help you. I don't sell any of them! But I do install them. I'm Mike, and my company Day's Concrete Floors, Inc has been installing garage floor epoxies, concrete floor stains and sealers for over 30 years. That's us above preparing a garage floor for an epoxy coating. I'll share with you what I have learned from my experiences and give you my unbiased opinion about which ones I like and don't like. 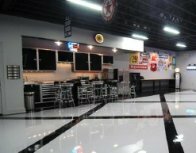 When I'm going to spend money or "invest money" on some type of flooring for my garage, I'm looking for three basic qualities. Durability - I want it to last a looooong time. These two floors look amazing! Both of them have a type of coating that I consider excellent. One is a polyaspartic polyurea and the other is a 2-part 100% solids epoxy. Polyaspartic polyurea's are the best type of garage floor coating your money can buy, in my opinion. They have excellent wear, scratch and chemical resistance. If installed correctly, they will last a long long time. And you can be as decorative or simple as you want to be. 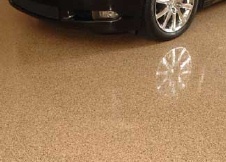 2-part 100% solids epoxy is another excellent garage flooring choice. A close second to polyaspartic's in my opinion. They're very durable, come in lots of colors and quite easy to keep clean. 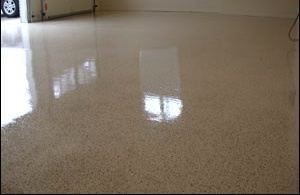 If the floor is in good shape a concrete stain with a clear top coat of polyaspartic polyurea or a 2-part 100% solids epoxy is another great choice. Stain gives the concrete a unique look that's very attractive. 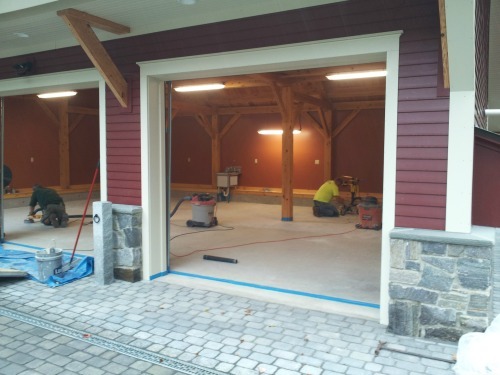 We install these three types of garage surfaces more than any other type of coating. In my opinion, these are NOT a do it yourself type of garage floor coating project. They all require some training, product knowledge and practice to perfect. 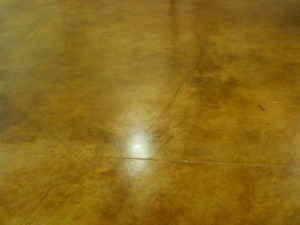 Concrete sealer is the most popular and probably least expensive coating you can apply on your floor. Sealers come clear or colored like the one I'm spraying on to the right. Sealers are a good product. They're easier to apply than epoxies but usually need to be re-coated every year or two. Roll on floor mats are simple to install. They come in many colors and textures. They're fairly inexpensive but they do get dirty quite easily. If you don't mind a little more maintenance to keep clean, this could work ok.
1 part epoxy, acrylic or latex concrete floor paint are the lowest quality flooring you can put on your garage floor. Of course that's my opinion, but that opinion comes with experience. I'm always getting calls from homeowners who've installed this stuff on their floor and they're wondering why it's peeling off after a month or two. 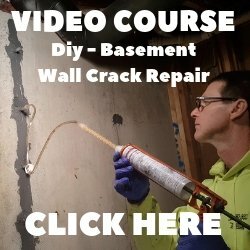 These products are just cheap, quick and easy to install. The problem is they just don't hold up to the wear and tear a garage gets from cars, foot traffic and work spaces. 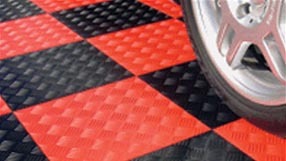 PVC floor tiles for garages are durable, easy to install and come in all kinds of colors. What I don't like is water and dirt gets in between the tiles. After a while the moisture can start to cause mold and mildew. The only way to clean under the tiles is to remove them, clean the floor and re-install the tiles. Doesn't sound like much fun to me. Add to that they're kinda pricey and I think I would avoid these too. 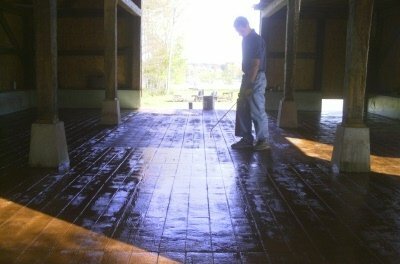 The best way to prepare a concrete floor for a floor coating. Here's a list of supplies you'll need. If you're going cheap, here's your step by step guide. For when you need to resurface your scaling, cracked floor. When you just want more about coatings. Covering garage surfaces, which one to choose. What garage floor finish is best for me.